*Conditions apply, ask consultant at time of booking. Designing and building your new bathroom is pleasure with Update Bathrooms. As leading bathroom renovators for over 35 years, we provide renovation services across Blacktown, Castle Hill, Parramatta, Penrith and Surrounding Sydney areas. Update Bathrooms have been creating dream bathrooms that are functional for a busy family or stylish for that private retreat at the end of the day. 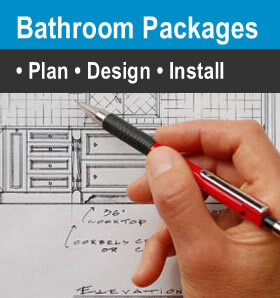 New bathrooms have to be methodically planned to allow smart use to existing floor plans. From the bathroom design to the construction Update Bathrooms will cater for your needs. As experienced bathroom renovators, Update bathrooms can incorporate a glass brick window that opens to ventilate your new bathroom or maybe a fully opening louver window would suit your ventilation problem. Bathrooms of today are fully tiled with suitable materials including, ceramic porcelain and marble tiles for the floor and walls. Vanity units vary from units that sit on the floor, units that have chrome legs to have a modern style or vanity units that are wall hung to be the feature of your new renovation. Update Bathrooms can custom make that odd size unit in polyurethane finish with a matching ceaser stone top and china bowl so we are flexible to your needs and styles for you bathroom makeover. Here at Update Bathrooms we can completely renovate your bathroom or partly renovate it, perhaps a small bathroom renovation or disabled bathroom renovation is required, bathrooms with walk in showers, bathrooms with structural alterations by moving walls that involves major carpentry or joinery for that space saving cavity sliding door or built in linen cupboard for extra storage. Heating today has many different options from underfloor heating with timers, 3 in 1 heat lights with ducting for the exhaust, towel ladders that heat to keep those towels cosy in winter down lights to show case your new bathroom remodelling project. Update Bathrooms are also licensed and experienced for kitchen renovations and laundry renovations. Whether you need a full kitchen design or laundry design we can cater for your needs and requirements. So call the home improvement experts and turn those renovations into reality. Your new bathroom renovation, kitchen, or en suite is just a phone call away. Whether you want to renovate, or remodel. Call Update Bathrooms now on 0418 253 639 to arrange your Free In-Home Consultation. Complete makeovers of your bathrooms, kitchen, laundry are our specialty.